Dollhouse | Color Ink, Inc.
One of the more popular items produced by FunDeco has been our Children’s Dollhouse. 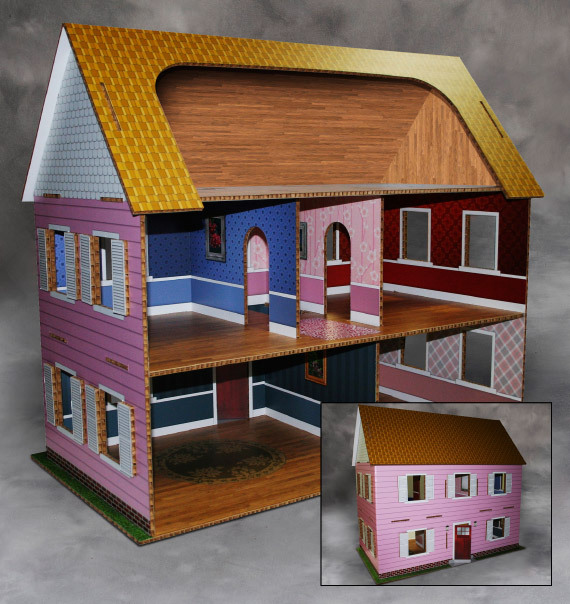 Measuring 32″ wide, 28″ tall, and 17.5″ deep, the Dollhouse is the perfect size for any child. The most staggering aspect? The price: just $25! Made of the same rigid, lightweight honeycomb board that is used in our Serving Centers, Bean Bag Toss Games, Wall Clocks, Pub Tables, and more, our Dollhouse is sturdy enough to withstand damage inflicted by your little ones. All rooms in the FunDeco Dollhouse are brightly decorated with wallpaper, moulding, flooring, fireplaces, and area rugs – all printed directly on the interior walls.